Room was very nice and got upgrade. Great place, great location and great staff. It is an 170 years old Japanese inn (Ryokan) and the location is perfect, fust on the main street that leads to the famous Zenkoji-temple. Rooms are Japanese style, but very nice and comfortable. There is only one room with shower and toilet, that is the one we have got, for an extra $10 per person, it is worth it. All other rooms have a common-shower room, which is nice too. Actually, you can have it al for yourself usually and it is with a big hot pool. Breakfast was very good. On the main road of Nagano, very close the Buddhist temple. Had very steep stairs (3 flights to get to our room on top floor, not suitable for young children. Ryokan is older but still authentic and comfortable. Really enjoyed our stay. Quite comfortable and good location. Very attentive and kind hosts. Understanding and helpful with guests needs. This was my second ryokan stay and like the first it was brilliant. The owners are lovely and whilst their English wasn't great it was easy to communicate with them. The onsen was not as large as others i have visited but it is still a decent sized onsen. The building is a cool old maze of stairs and platforms that give much character. Located half way between the train station and the temple you will have easy access to Nagano. This is a very cute hotel it located in a walkable are in the city of Nagano. The stuff is old Japanese couple, they're friendly and cute. Not very business type as in big city hotel. Around that are is a shopping are, plenty of food and drinking place. The city is also very cute. Shimizuya offers a great value in a ryokan experience in Nagano. The owners were helpful and friendly, the interior is extremely authentic and the location excellent. this ryokan is old but well maintain, clean and neat. certainly a good experience to stay here. please try their breakfast, is very nice. the location is walking distance to a famous shire. near to bus station too. from the baths to the breakfast to the decor, this is a perfect small japanese inn for weary travelers. i've now stayed there twice, and the second time i felt quite confident leaving my teenagers there alone for several nights while i attended a business conference. whenever i return to nagano i will stay at the chimizuya ryokan. The Inn is located about 20 minutes from the Nagano train station. It's run by an old Japanese couple who speak very little Japanese. But they are incredibly hospitable as most Japanese are. However, the inn, is rather old. There are no en suite bathrooms or toilets. The toilets and baths are commonly shares. The tatami rooms are old, but it does give it a certain charm! It's almost like entering a time warp and staying in the past. Very quaint. But a tad expensive given that the inn is so old. Only breakfast is included. But that is not a problem as there are loads of eateries in Nagano city! Traditional Japanese Ryokan. Shared bathroom facilities with male and female facilities. Steep stairs to rooms. Clean and welcoming. Japanese breakfast was tasty. No evening meals provided. Very close to other dinning options. Heavy suitcases can prove to be difficult to manage in ascending and descending from room. Curfew at 11 p.m.
highly recommend for a traditional stay experience! lovely inn, and family operators. large rooms. would not recommend for people with a disability, many high stairs to get up and down to rooms and toilet (western style) on separate floor to rooms. no western shower / bathroom - traditional japanese 'bath', wash and shower off in communal area then soak in communal hot bath (separate men and women areas) - not for the shy bathers traditional japanese breakfast - very filling and enjoyable. although not close to station or main shops, still convenient and very close to temple. the hotel and the hosts are lovely - a traditional style ryoken with a b&b feel about it. no toilet or shower in our good sized room (8-mat size),as expected, but decent shared onsen. a nice break to the western stle hotel we used in tokyo. highly recommended. The owners were so friendly and welcoming. They seemed like our Japanese parents waiting up for us with extra pillows! The Ryokan was a really interesting old house full of quirky features but at the same time an insight into traditional Japanese style and living. Very attractive rooms, great staff. 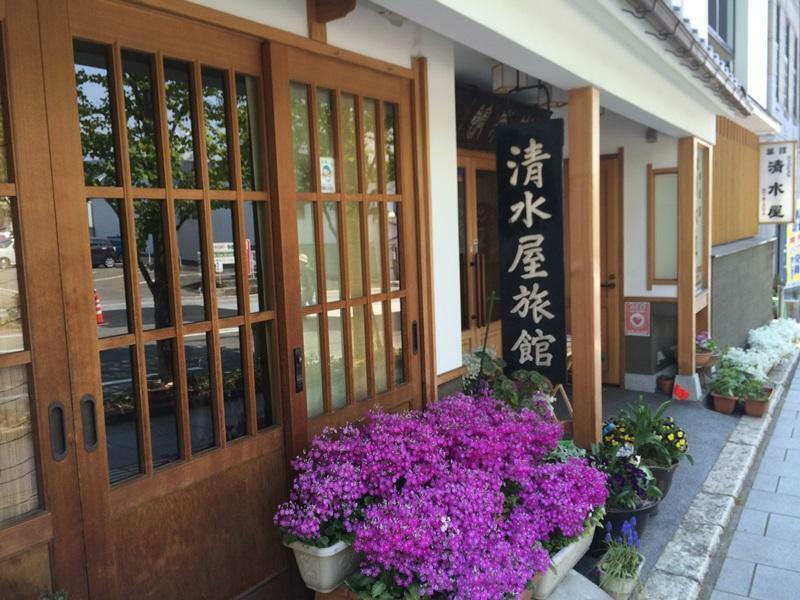 this ryokan is in a great location on the main street leading to the temple. the rooms are very attractive and the staff warm and friendly. this ryokan also provides an amazing breakfast. loved my stay there! we spent 3 nights in this lovely place, we stuffed up the booking and arrived a day early, the staff gladly looked after us. the hotel is more like a hostel with a japanese feel, the staff are beutifull and are very very helpfull. all that is needed is available, internet (free), coin laundry, etc. we even got a loan of a pram wich was a great help. the hotel is close walkin from train station and close to the main temple in town, there are also plenty of shops, caffees and resturants very close by. we would definately use this hotel again. the mens bathroom "onsen" could use a clean up but the females is much better. we found the hotel great with a small child as we were always on the floor sleeping and eating.